Melbourne, FL – Officials with the Aldrin Family Foundation (AFF) today announced one of the most significant contributors to the historic Moon landings, Northrop Grumman Corporation (NYSE: NOC), has signed on as the title (Diamond) sponsor of the Apollo 50th Gala. Taking place on July 16, at the iconic Apollo/Saturn V Center at the Kennedy Space Center Visitor Complex, the event will gather an intimate group of space legends, celebrities, VIPs and space enthusiasts from across the globe. The event will celebrate the historic accomplishments of the past, but also examine humanity benefits from making giant leaps in technology and engineering. Proceeds from the event will benefit AFF science, technology, engineering, art and math (STEAM) education programs and an endowed scholarship for the Astronaut Scholarship Foundation. Northrop Grumman legacy companies also provided the Lunar Excursion Module Descent Engine, 15 different propellant motors for every Saturn V rocket, software for multiple spacecraft functions, the backup communications system, S band antennas and the cameras that broadcast to a global audience Neil Armstrong’s and Buzz Aldrin’s first steps on the moon and the flagpole that proudly displayed the American flag in the Sea of Tranquility. 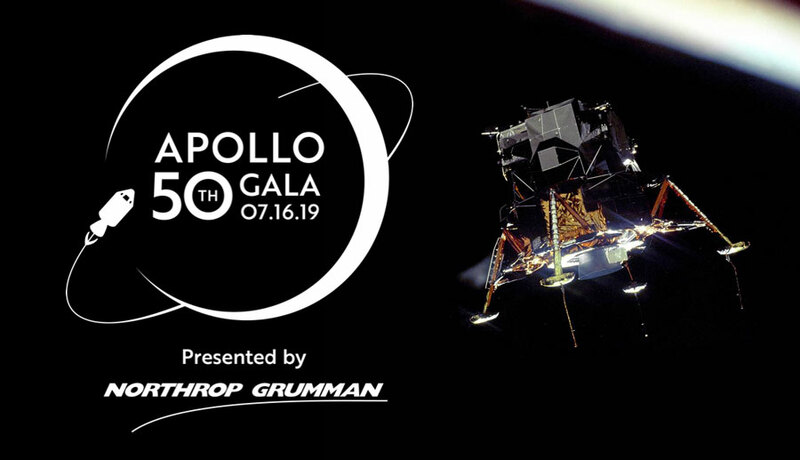 The Apollo 50th Gala, presented by Northrop Grumman, will be hosted on the date that Apollo 11 launched from Cape Canveral, Florida in 1969. More than 500 guests will attend the celebration which will feature a panel discussion with space legends of Apollo, live and silent auctions with one-of-a-kind space memorabilia, and awards to recognize individuals who are pioneering space and molding the next-generation workforce. All proceeds raised from the event will benefit the Aldrin Family Foundation and the Astronaut Scholarship Foundation. The Aldrin Family Foundation (AFF) strives to cultivate the next generation of space leaders, entrepreneurs and explorers who will extend human habitation beyond the Earth to the Moon and Mars. AFF’s STEAM-based educational tools, curriculum and programs span from a child’s first classroom experience through graduate school and professional programs. This vertical pathway unites explorers at all levels to learn from each other’s vision for space, ultimately creating the first generation of Martians. For more information, visit www.aldrinfoundation.org. The Astronaut Scholarship Foundation (ASF) is a 501(c)3 nonprofit organization that provides annually more than 50 scholarships to the brightest and most talented college students in science, technology, engineering and mathematics. It was formed in 1984 by heroes from the Mercury, Gemini, Apollo, Skylab and Space Shuttle programs. Their goal was simple – to use their experience and credibility to encourage student pursuit of advanced education and scientific endeavors to keep America on the leading edge of technology. Today, these heroes, along with top industry leaders, educational institutions and individuals, have joined the cause. ASF Scholars not only honor the legacy of America’s pioneering astronauts, but continue their passion for knowledge, discovery and progress in multiple industries. For more information, visit www.astronautscholarship.org.